Although anxiety is often thought of as an adult problem, it’s also a childhood disorder. While children do not face the same life obstacles as adults, they have their own issues and struggles. Anxiety may be rooted in a specific phobia, such as fear of the dark or fear of spiders, or it may be related to specific situations, such as school or social phobias. Separation anxiety or significant difficulty with transition is often seen in children as well, as is generalized anxiety and discomfort with the unknown and unpredictable. Children may manifest symptoms of anxiety in several different ways. While some children are able to articulate their fears and stressors, others may express their anxiety through somatization of symptoms, avoidance behaviors, crying, or tantrums. 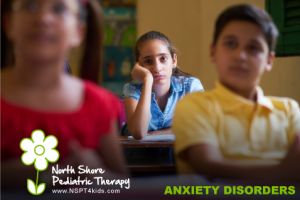 Anxiety in children should be addressed the same in home and school settings with the goals of identifying the sources of anxiety and learning adaptive coping skills. Developing skills to promote healthy self-esteem and decrease negative self-statements. Children dealing with anxiety in the school environment should also receive academic accommodations and services, whether through a 504 plan or an Individualized Education Plan (IEP). Parents are encouraged to work with school staff to develop the plan. Allowing the student to take a break when needed to collect him or herself or talk to a trusted adult. Extra-curricular programming and relaxation (e.g., art, drama, playing a musical instrument, yoga, martial arts, running) are also recommended, as they have been proven beneficial in supporting the development of self-regulatory capacity. It is recommended that children participate in structured social or athletic activities in order to facilitate healthy peer relations and self-esteem. There is often a strong chemical component in children with anxiety disorders. In some instances a combination of therapeutic intervention and pharmacological intervention will yield the best outcome. It is recommended that parents consult with their child’s pediatrician to learn about the potential risks and benefits of pharmacological treatment. Cognitive Behavioral Therapy (CBT) is the most empirically supported format for therapy in addressing anxiety. Resources are also available for families through the Anxiety and Depression Association of America website, www.adaa.org. Other resources for families include workbooks such as the What to Do When You Worry Too Much series by Dawn Huebner and The Coping Cat by Philip C. Kendall.